This section is the review material consisting of labs which should be solved in 10 minutes or less. It also contains questions regarding particular technology. Download: topology diagrams and .net map. Here’s your layer 2 Topology diagram. Click on image to enlarge it. 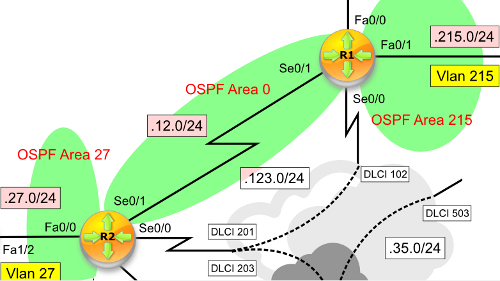 Configure OSPF area 0 on Ser0/0 of R1, and R2 using default OSPF mode of operation. 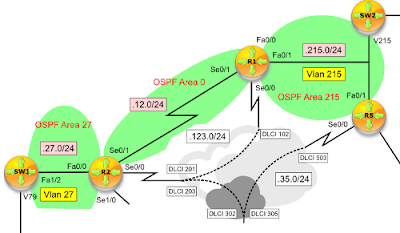 Enable OSPF area 0 on R3‘s Ser0/0.123 sub-interface and its Loopback0 interface. Ensure there is full reachability and full adjacency in Frame-Relay network configured. Ensure R3 can ping 10.0.1.1 (R1′s Loopback0) sourced by its Loopback0 interface. What is the default OSPF mode used on NBMA (non-broadcast, multi-access interfaces) links? What is/are compatible OSPF modes with the default mode used on NBMA links? What would you configure to make other OSPF mode to be compatible with NBMA? What are the default timers (hello/dead) used on NBMA links? How are OSPF neighbors discovered on NBMA links? Which OSPF routing context command is required for the routers to establish OSPF communication? What is going to happen if an OSPF router receives a unicast addressed ‘hello’ packet from its OSPF neighbor? What OSPF router roles does NBMA network elect? Which command shows the role of the router on a specific NBMA link? In case of hub-and-spoke NBMA topology, what OSPF role should spoke routers take (justify your answer)? 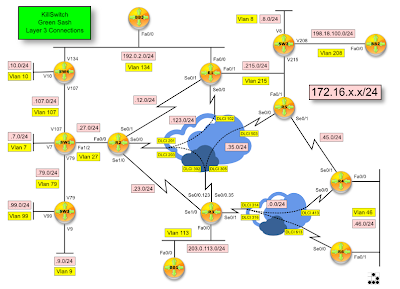 What are the two ways of configuring the required role in a spoke router in NBMA hub-and-spoke topology? What is OSPF next-hop behavior on NBMA links in a hub-and-spoke topology? What do you need to take care of regarding next-hop? In case of non-broadcast OSPF mode, what does LSDB show as far as the following are concerned (assuming default ospf mode): link connected to, link id, link data? Can R3 reach R1‘s Ser0/0 with the default configuration (before you have introduced changes)? What NBMA role should the spokes (R1 and R3) play in this configuration? Does R3 use 172.16.123.1 address as its next-hop towards 10.0.1.1? Verify which router has become DR in VLAN 27 (most likely it is going to be R2). Force the re-election of the DR making sure that previous BDR becomes DR, and previous DR becomes BDR. Do NOT shut down any interface to accomplish this. Do NOT clear ip ospf process to accomplish this. Do NOT reload the router(s) to accomplish this. Are DR/BDR roles pre-emptive? Why? What would be the quickest and causing least interruption way of changing the OSPF role in a broadcast network? In Case of the same OSPF port priority, what parameter is going to determine DR/BDR election? What would happen if neither SW1 nor R2 became DR? Check your answer in practice. Do you really need a hint here? Looking for a kindergarten? Wrong place dude. On SW1 enable OSPF area 27 on VLAN 27 and Loopback0 interfaces. Do NOT use ‘network‘ statement or redistribution to accomplish the task. On SW2 and R5 enable OSPF area 215 on their Loopback0 and all interfaces with VLAN 215 membership. Use ‘network‘ statement with the most specific wildcard mask to accomplish this. Make sure SW2 is never elected a DR in VLAN 215. R1 should always be elected DR in case interfaces in VLAN 215 came up at the same time. Why does OSPF elect DR/BDR on certain types of networks? In what network types does OSPF elect DR/BDR? Does DR have to have full layer 2 reachability to other OSPF routers connected to the same segment? Why? What do we call a router that is neither DR nor BDR? If there are four routers connected to the same broadcast segment (the same broadcast domain), what are going to be OSPF states negotiated between them? In case of broadcast OSPF mode, what does LSDB show as far as the following are concerned (assuming default ospf mode): link connected to, link id, link data? What IP address is used when sending updates towards DR/BDR? Does R5 see R1 as the DR and SW2 as DROTHER? Enable OSPF area 215 on the link of R1 in VLAN 215 (Fa0/1). Enable OSPF area 27 on the link of R2 in VLAN 27 (Fa0/0). Use ‘network‘ statement with wildcard mask that matches the network mask of the interface. 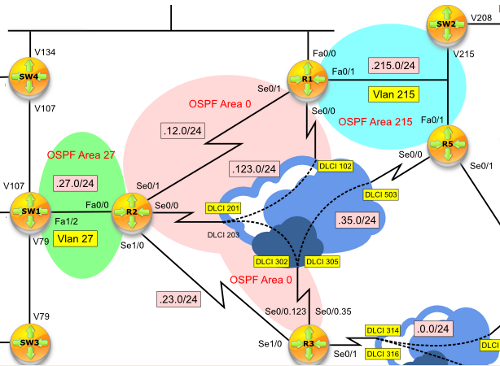 What are the benefits of using OSPF multiple area topology? What do we call area 0 in OSPF multiple area topology? In the OSPF lab completed, what do you call R1 and R2 (routers connected to area 0 and other area)? What are LSA types: 1, 2, 3, 4, 5, 7 and what do they communicate in OSPF domain? What do we call an OSPF router whose all links belong to a single area? What do we call an OSPF router whose all links belong to an area 0? Does R1 see 172.16.27.0/24 in its routing table? Does R2 see 172.16.215.0/24 in its routing table? Does the ping sourced from Fas0/0 of R1 destined to 172.16.27.2 work? How would you verify that VLAN 27 and VLAN 215 links belong to the areas specified in the task? Enable OSPF in area 0 between router R1 and R2 on their point-to-point links (Se0/1). Advertise Loopback0 address of both routers in area 0. Use ‘network‘ command with the most specific wildcard mask to accomplish the task. What are the OSPF modes of operation available in Cisco® IOS™? Which OSPF modes are RFC-based and which are Cisco® proprietary? Which layer of OSI model would you classify OSPF to? OSPF creates three tables. What are these? 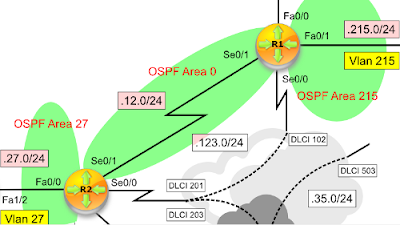 What does the ‘link-state’ in OSPF describe? What is OSPF hello packet and what is/are its purpose(s) in OSPF domain? What are the two link-local multicast addresses reserved for OSPF communication? What OSPF parameters must match in OSPF packet to establish full adjacency? What is the default destination address OSPF uses to send ‘hello’ packets on point-to-point links? What are the five packet types OSPF uses to communicate? What do they do? Which command would you use to verify OSPF-enabled interfaces (do not use ‘show run’)? Which command would you use to verify the state of the OSPF neighbor? What is a ‘router id’ in OSPF? How does OSPF selects its ‘router id’? Is OSPF ‘router id’ pre-emptive? Can you provide at least three commands to display OSPF router id (what are these)? What would happen if you tried to enable OSPF protocol in a router that has not a single IP address configured? Which command would you use to display LSDB? How many point-to-point links does an OSPF router advertise according to LSDB? What are the default timers (hello/dead) used on point-to-point links? What is/are other OSPF modes of operation that are compatible with the default one used on p2p links? What do you need to configure to make other mode(s) compatible with point-to-point mode? 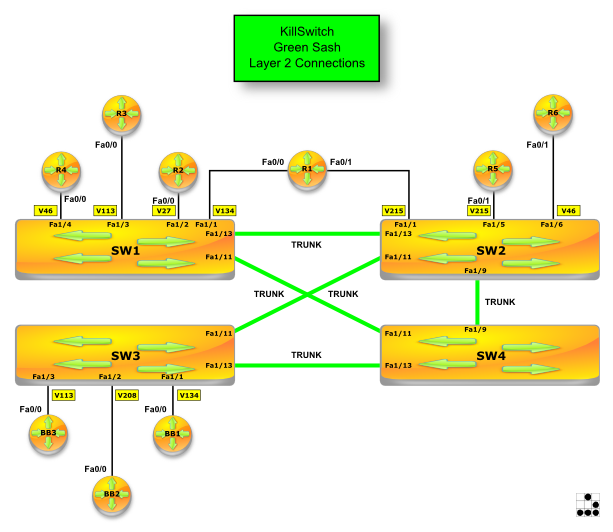 Which DBD parameter must match between OSPF neighbors to get past 2-way state? What is the type of LSA (name and number) that describes the links to other routers in the same area? Which command would you use to display LSDB entries about LSA type 1? In case of point-to-point OSPF mode, what does LSDB show as far as the following are concerned (assuming default ospf mode): link connected to, link id, link data? Does the ping from 10.0.1.1 towards 10.0.2.2 work?